The Greubel Forsey GMT model is a pure eye catcher, one of those watches that you can't stop staring at. It was first introduced in 2011 in pink gold and in white gold, followed by a platinum version earlier this year. For the latest interpretation of this exclusive timepiece, Greubel Forsey opted for a titanium case treated with vacuum deposited ADL (amorphous diamond-like carbon). The deep black coating of the GMT Black gives the watch not only a striking appearance but also an exceptional surface hardness and resistance to scratches. The unique asymmetrical case maintains the original size, with a diameter of 43.5 mm and a total height of 16.14 mm. The movement's main plate and bridges are also treated in black emphasising the contrast between the different surface finishes in each component's decoration and making the various functions stand out very clearly for an excellent readability. 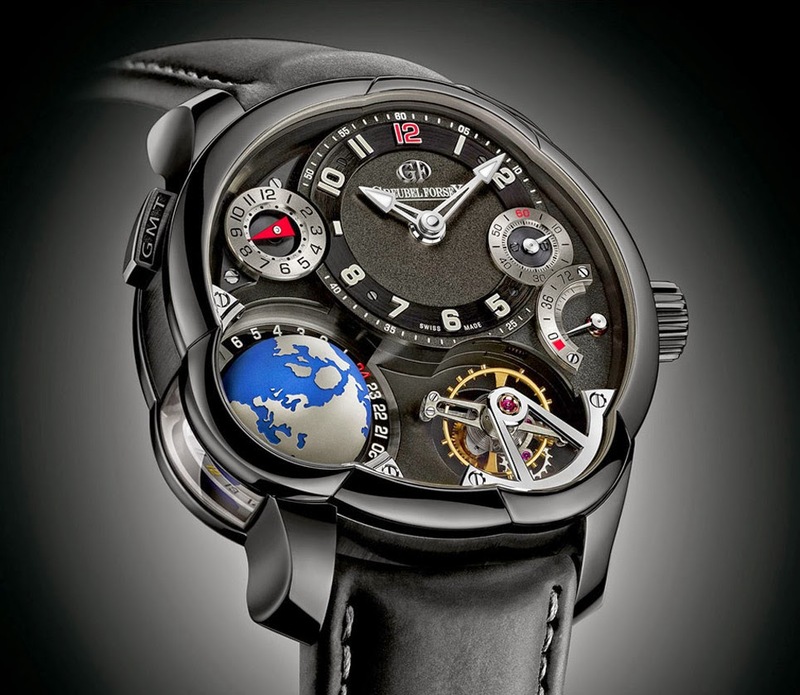 The second time zone is indicated by the red triangle hand on the small dial at 10 o'clock and it is complemented by a titanium-made three-dimensional and rotating globe (partially visible also through the lateral window), a solution which somehow steal the spotlight to the precious inclined tourbillon positioned between 5 and 6 o'clock. 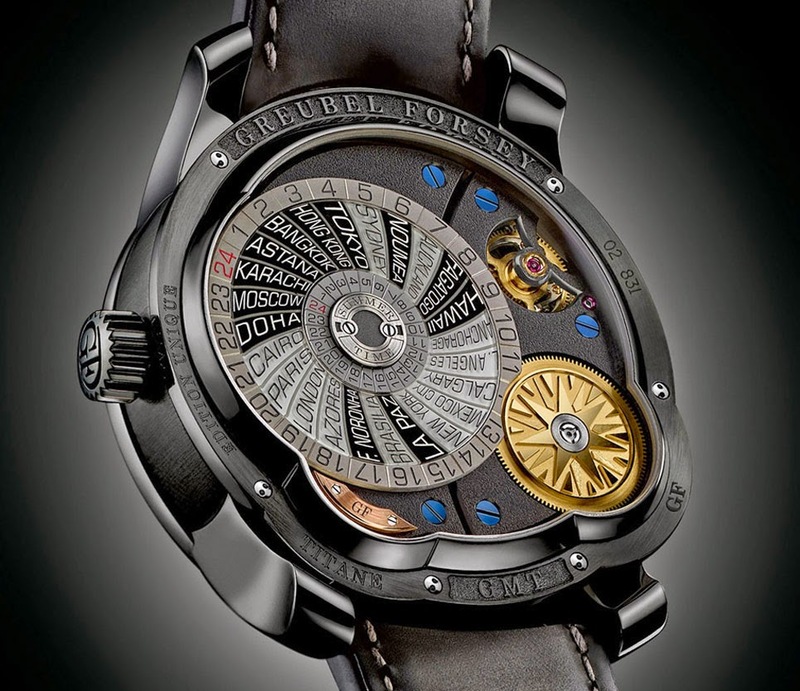 On the back of the timepiece, a worldtime disc with cities in each of the 24 time zones provides an alternative view of universal time. Adjusting the second time zone is fast thanks to the push-button at 10 o'clock. The GMT calibre GF05 beats at 21,600 vibrations per hour and offers 72 hours of power reserve. Comprised of 87 parts and weighing just 0.36 grams, the tourbillon cage completes a rotation in 24 seconds. 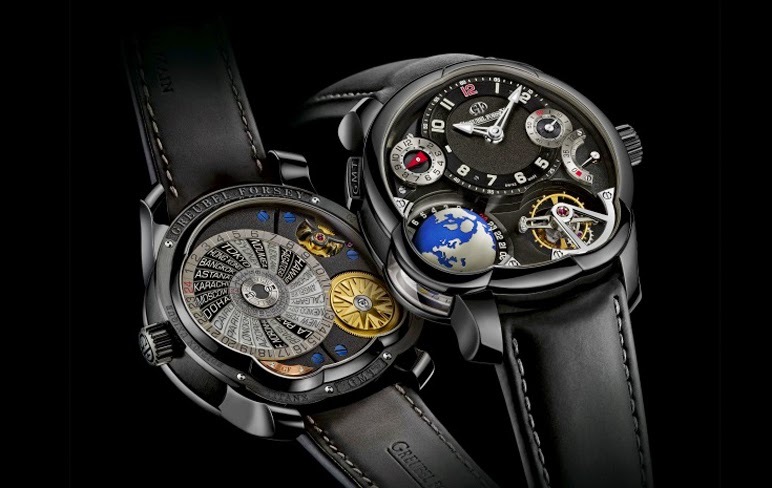 Pre-SIHH 2015: Greubel Forsey GMT Black. For the latest interpretation of this exclusive timepiece - the GMT Black - Greubel Forsey opted for a titanium case treated with vacuum deposited ADL (amorphous diamond-like carbon). 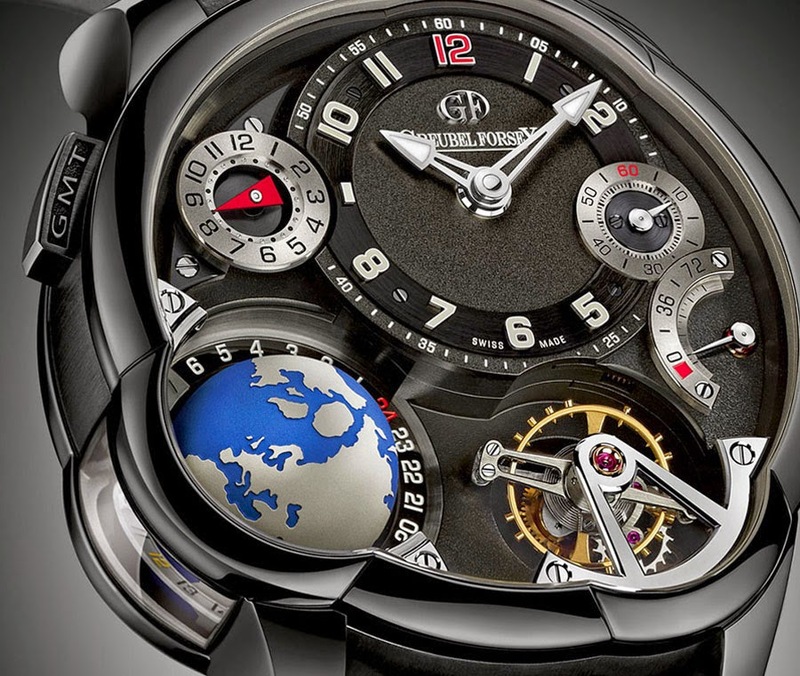 Produced in a limited edition of 22 pieces, the price of the Greubel Forsey GMT Black is also exceptional at US$ 565,000.